We received a Lego-style toy from Sluban Products Canada. The box doesn’t really give this toy a name – it just says Aviation. It’s supposed to be an Airport Delivery Truck, but if my contact hadn’t told me that was what it was I’d just think it was a mail van. This brand suggests it’s compatible with “other brands” (which I took to mean Lego) and it seems to be. I didn’t actually build anything with parts of both but I did stick a few pieces together and they seemed like they would work. Overall it went together well, but it needed a lot of adult help. They tried very hard to do it on their own, but some of the pieces needed serious force to get them to click in firmly. Truth be told, I’m not looking forward to taking it apart. This car has a lot of the small, thin (half height) pieces which I can’t get apart in any sets! And I had to put the stickers on as well – they didn’t peel off the paper as easily as they could have. One actually peeled the paper off the sticky backing and caused Rose to go cry in a ball on the couch. 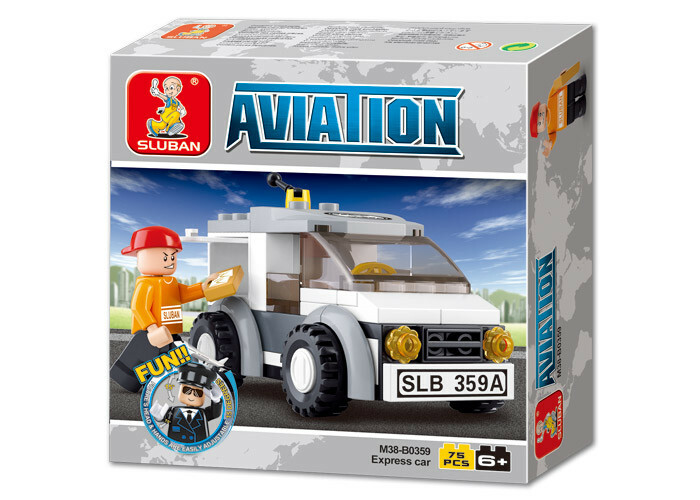 This Sluban toy company seems to work as a generic Lego alternative, although the price isn’t as “discounted” as I’d like to see for the quality of the product.